In the art world, there are hundreds of mediums you can use to express a creative concept conceived in the mind. Some people pick paint; others turn to clay and still more are constantly looking for a new way to express the designs they yearn to create. Rachel Goldsmith is an artist who used to work mainly with water-based paints and permanent inks. Louis DeRosa is an animator who specializes in illustration. These two creative minds each produce profoundly different work, yet both found their stride in recent years with a new tool: the 3Doodler, the world’s first 3D printing pen. Both Goldsmith and DeRosa developed a passion for the 3Doodler within minutes of first picking up the pen. Rachel uses the tool to develop intricately “woven” pieces of fine art and Louis uses it to create unique figurative objects, built up layer by layer. The different ways these artists utilize the pen speaks to the product’s potential in the maker’s space. There’s no limit to what creations can emerge from imagination and steady supply of plastic. Today, Goldsmith works as an artist that creates pieces with PLA plastic. DeRosa is an advocate of the 3Doodler pen, traveling on behalf of the company to present live demonstrations of the tool and teach people how to use it. Both work closely with the 3Doodler founders, Maxwell Bogue, Daniel Cowen and Peter Dilworth, advising on educational materials, testing new product upgrades, and creating content for 3Doodler marketing materials. UPWARDS sat down with the two artists to learn more about the unique ways in which they use the 3Doodler, and how it has shaped their artistic endeavors. How did you first learn about the 3Doodler? 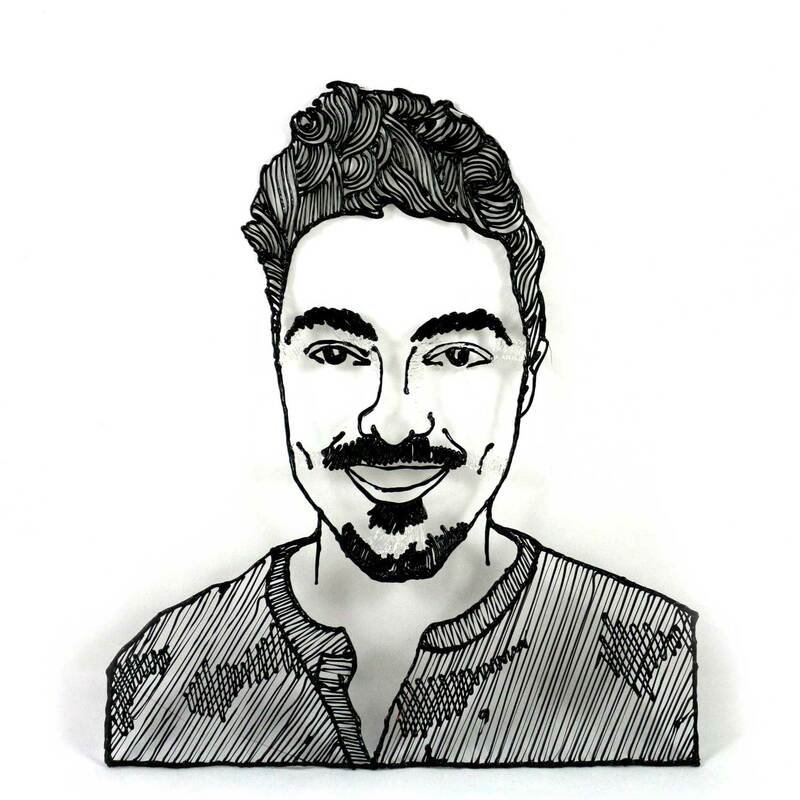 DeRosa: I was finishing up my last year of college for animation, and I was pretty interested in the whole maker movement and 3D printing, but it was not exactly something I could afford to just get into. I saw a Kickstarter ad pop-up for a handheld 3D printer, and decided to back the project right away. What made it a no-brainer for me, was my interest in drawing. I always had a sketchbook with me. The notion of taking that new frontier of 3D printing and having it be handheld really appealed to me. Goldsmith: I came about the pen having no knowledge of plastic or 3D printing. As an artist, I always had a sketchbook—like Louis did—and I was drawing constantly. When the 3Doodler Kickstarter launched, one of my good friends, as well as my dad, said “You need this.” And my dad immediately backed the project for me. What was your first experience like with the 3Doodler? DeRosa: Interestingly, the very first thing I doodled was a human figure. My approach was trying to be like a 3D printer. I had seen the way 3D printers worked—how they go layer by layer, building upwards—and tried to replicate that. I quickly realized that the pen could do way more than a 3D printer could do because the design was completely up to me. Goldsmith: My first instinct was to use the 3Doodler directly on a canvas in the same way I’d use paint. I was “painting with plastic”: cross-hatching the lines so the colors would blend, thus expanding the limited color palette and playing with different textures. To this day, my work is still focused around the many ways of using the 3Doodler to create color and texture. How did you first get involved with the co-founders, Max, Dan and Peter? Goldsmith: I posted the first piece I did with the pen on Twitter, and Dan reached out to me to ask if I was interested in helping them create a piece for the MoMA design store window display. I kind of lost my mind with excitement over the opportunity. DeRosa: I had called customer service about the pen and, lo and behold, I was speaking to Max Bogue. That in, in and of itself, was awesome…that he was so involved. Shortly after that, like Rachel’s experience, I had a little doodle of my dog that I posted on social media. Dan saw it and they extended the same invite to me: to come and be a part of the demonstration at not only the MoMA store, but the Kickstarter headquarters, which was beyond exciting. Can you speak to the very distinct and different ways you each use the pen in your creations? Goldsmith: I find these differences really interesting. Louis thinks of everything in a 3-dimensional way. For example, he thinks of the surface area, whereas I think of the contours, so it’s fascinating to me how differently we interpret the same idea. DeRosa: I can say from an outside perspective, that Rachel occupies a very unique space. 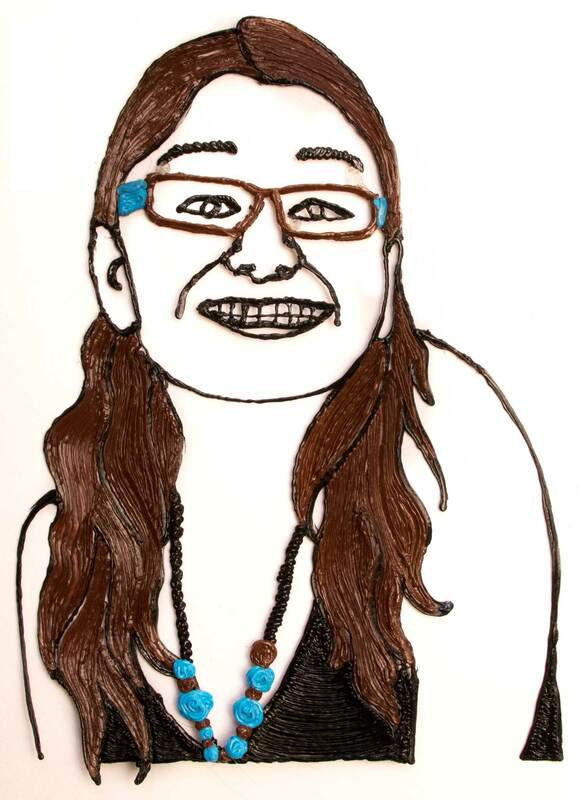 She’s solely responsible for elevating to fine art what you can do with the 3Doodler. As much as I would like to claim that what I’m doing is fine art, it’s not immediately perceived that way because a lot of what I’m making is mimicking things that you find in the real world—like action figures or little functional things. To me, I handmade it, so that’s exciting, but to the untrained eye it looks like something they’ve seen before. Why do you think the 3Doodler is so revolutionary? Goldsmith: I remember thinking “I’m creating a new form of art.” It blew my mind that I was one of the only people in the world doing something like this. It’s beyond amazing to me how many people are using it now. There’s so much talent. DeRosa: It’s amazing to see this new, creative, technical tool for the first time, and seeing people use it in ways I hadn’t thought of yet. That aspect of it has been maybe the most exciting. To sort of be on this journey with people all over the world that are trying out something new. Do you think we are anywhere near seeing the full creative potential of the 3Doodler? DeRosa: The pen and pencil have existed for hundreds of years, and I believe that’s a medium that is still being pushed. So, I don’t think we are going to see the boundaries of what this device can do in our lifetime. Even the current iteration, I’ve spent so many hours using it, and even when I’m not using it, I’m thinking about new ways to use it. Then still, I see somebody doing something that I hadn’t thought of yet. I believe that as more individuals experience it, more intentions will come to light for it. This is the third in a series of conversations about 3Doodler with the people who know it best. Here you can find our first piece with co-founders Daniel Cowen and Max Bogue. Here you can find our second piece with Creative Director Faraz Warsi and Junior Designer Erin Song.